Arriving at White Cube Bermondsey on a Sunday afternoon is an event in itself. The spaces are alive and noisy with crowds moving through the expansive corridor and its adjacent galleries, gathering together, queuing, sitting and talking. 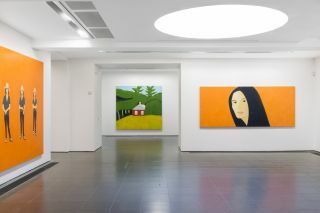 There is a striking sense of liveness to the gallery, no doubt due to the anticipation of Mica Levi’s performance that starts in thirty minutes, but this living presence within the exhibition space is also a conscious creation. 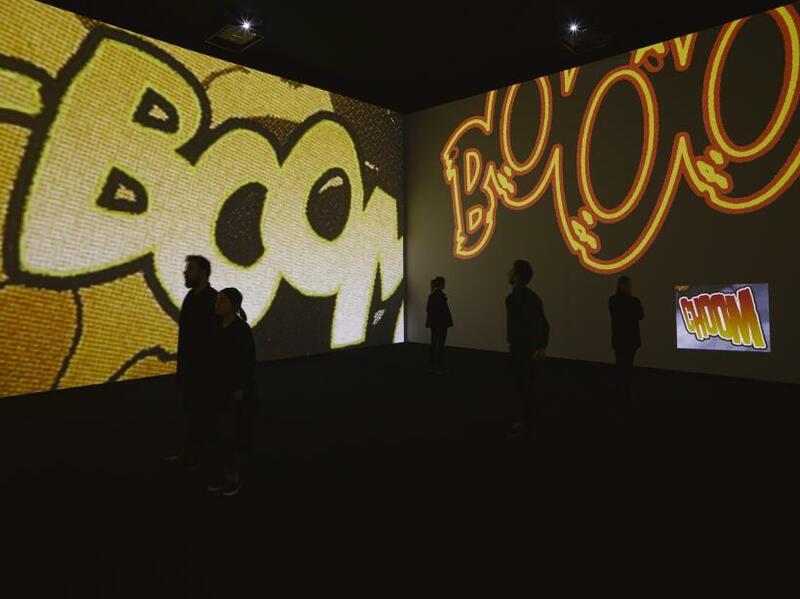 For this major solo show, Christian Marclay’s intention is to close the gaps between moments of looking and listening, or indeed being looked at or listened to. 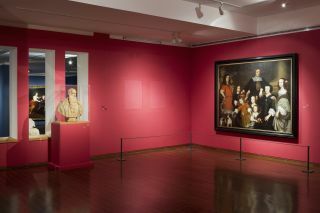 Sound, word and image become the artist’s tools with which to record and reproduce the activities that play out within the gallery: the exhibition as a site of production. 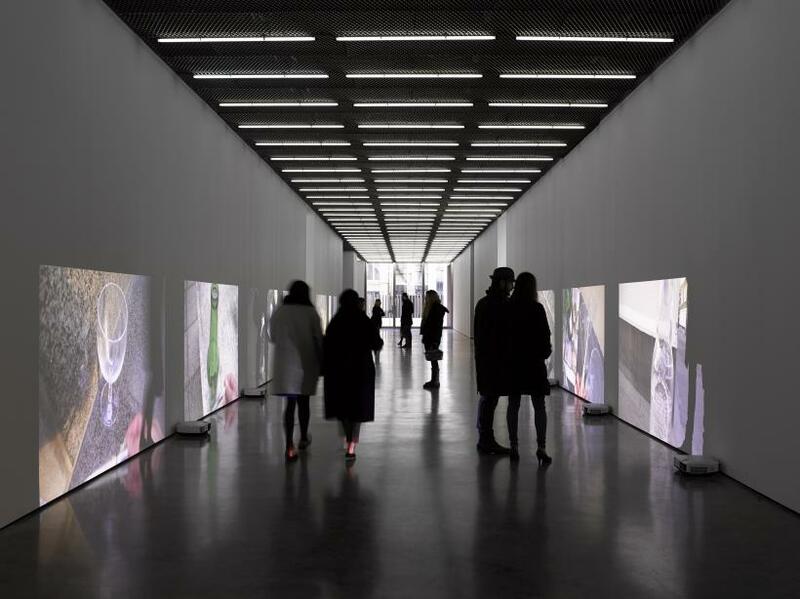 Certainly it is Marclay’s desire to disrupt our patterns and habits when visiting art exhibitions, as the show switches between passive and active spectatorship. 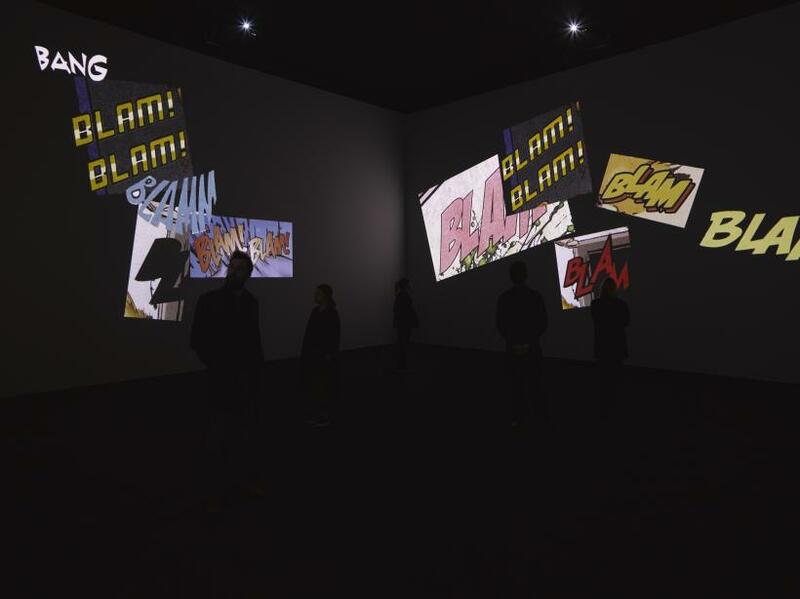 We look at a series of works on canvas and paper – highly gestural pieces that crudely bridge the gap between Pop Art and Abstract Expressionism – or we enter a contained, four-wall video installation of onomatopoeic words from comic books. 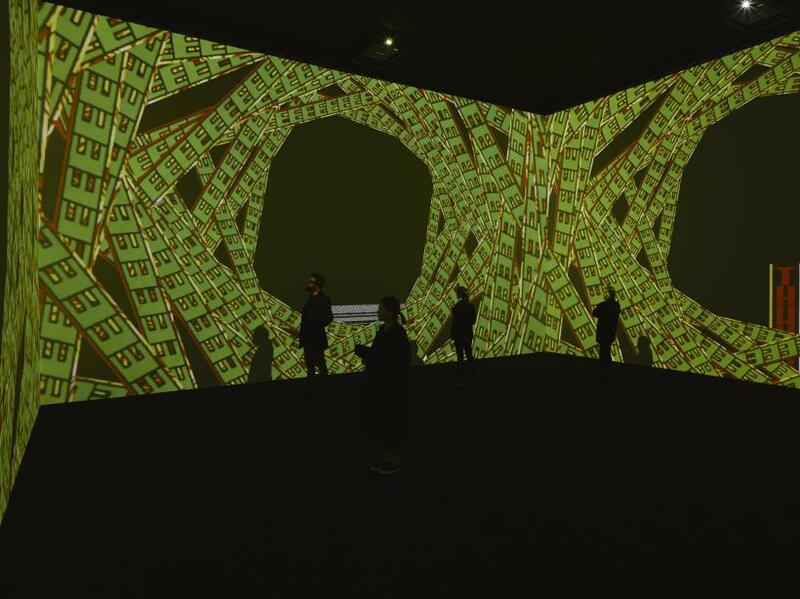 It is during this movement, however, that the shadows of our walking legs are simultaneously inscribed upon a series of projections that line the gallery’s corridor. This new video installation, ‘Pub Crawl’, is Marclay’s (and the visitor’s) anti-promenade. 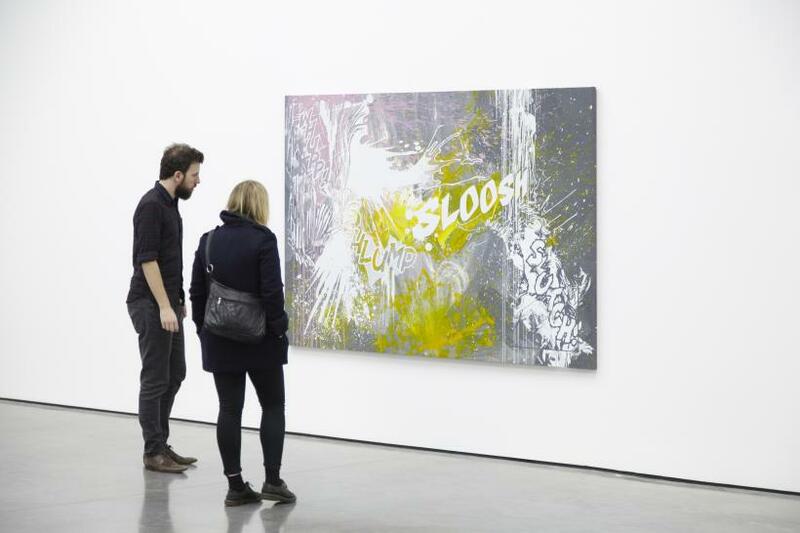 The clanging sounds of empty cans and bottles that the artist has found abandoned on the streets of East London reverberate beyond their contained images throughout the spaces of the gallery. 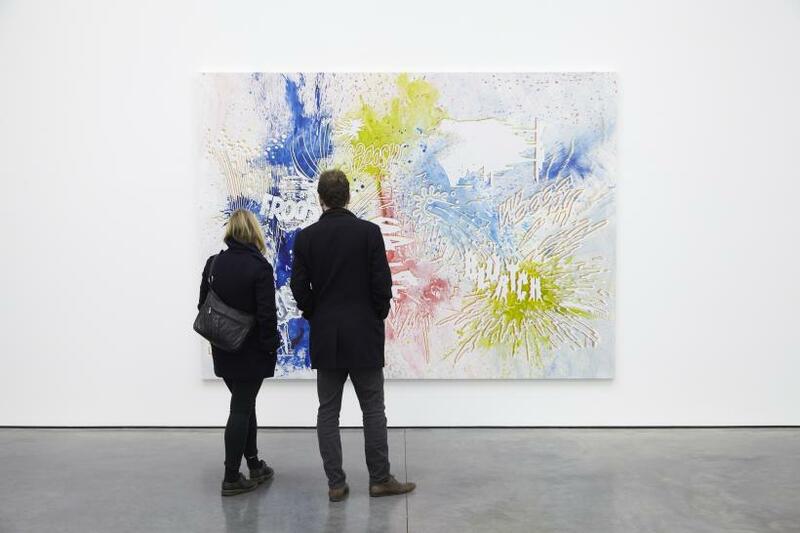 The dirty footsteps of the artist become merged with our own pathway down the White Cube’s polished floors. 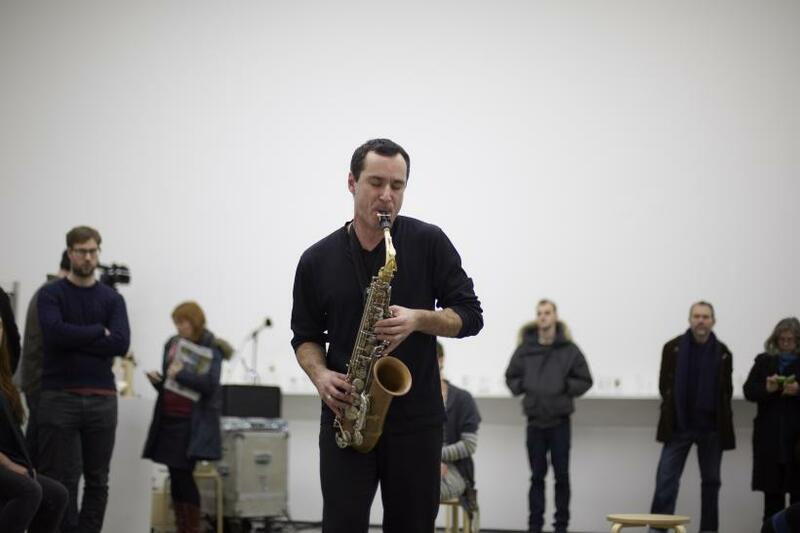 It seems that the empty drinking vessel is a leitmotif within Marclay’s composition, as further glasses flank the end gallery in which an eager gathering stands waiting for this weekend’s programmed performance to begin. The scene is odd: objects reminiscent of past drinking sessions are arranged en masse, but now cleaned and pristine. No dregs of flat beer to be seen. 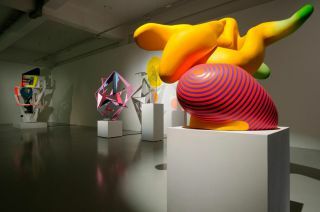 Similarly, the socialising crowd remain detached from these objects; they are reformed as sculptures in their invisible but definitely present no-touch zone. Silence descends as the performance begins: an intense, 15-minute composition that Levi arranged in response to the exhibition. A clarinet, violin and a cello capture, in an erratic flurry, the rise and fall of the chattering crowds that I entered moments earlier. They pause at several intervals, allowing for the sounds of Marclay’s broken bottles to call through, while the drummer responds by playing on an empty pint glass. 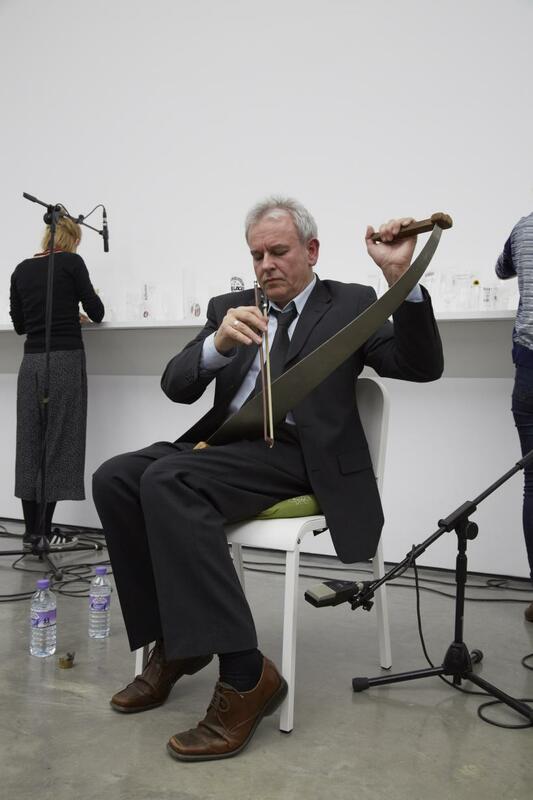 Levi’s composition expertly connects to Marclay’s clear interest in the dual function of these ‘instruments’: how something can exist simultaneously as an object of art and also an object with which to make art. 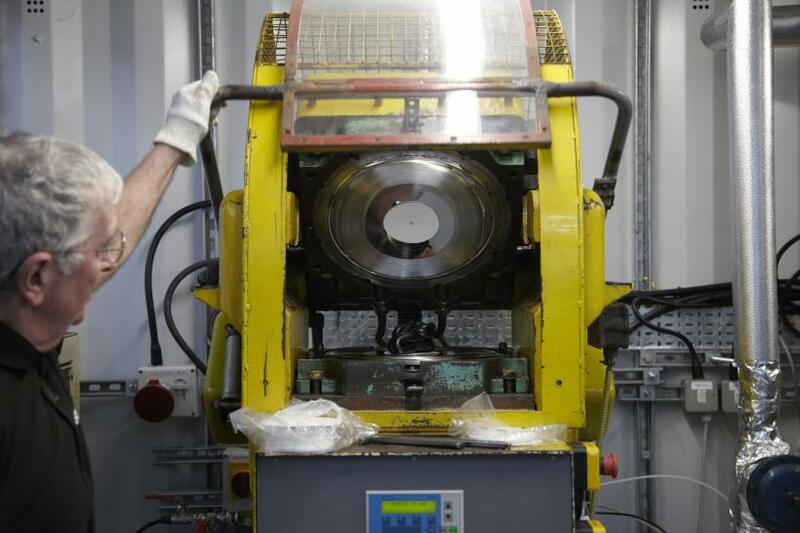 Following the event, the documented performance will be printed on vinyl and sold as an edition. The lines between sound and image are again dissolved within Marclay’s on-going chain of production.